After six years at GW, women’s soccer head coach Sarah Barnes announced her resignation last week. 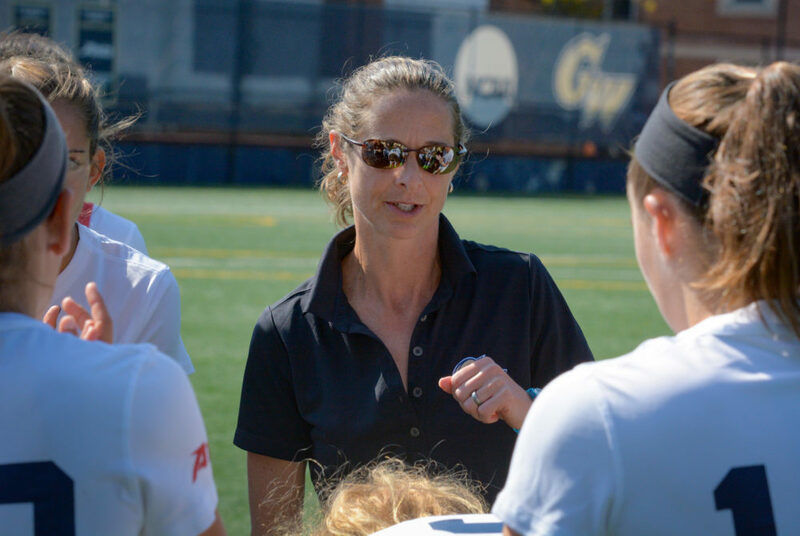 Sarah Barnes resigned from her position as women’s soccer head coach last week, GW Athletics announced in a release. She left her post after six years at the helm of the Colonials and accepted an offer for the same position at Miami. A search for the program’s ninth head coach will begin immediately, according to the release. Barnes did not respond to a request for comment. She took over the spot after Vogel moved on to an administrative position in late 2011. Under her direction, GW recorded a 60-41-14 record, including winning at least 10 games per season in four different years. During her six seasons at the helm, the Colonials’ best year was in 2015. During that season, they won 13 consecutive games, including a perfect Atlantic 10 slate that led to a regular season championship. For GW’s 2015 results, Barnes was named A-10 Coach of the Year. The following season, her team defeated Duquesne in double overtime of the first round of the conference tournament – the only time one of Barnes’ teams made it past their opening game. She finished her career in Foggy Bottom with the second-highest winning percentage in program history – behind Adrian Glover, who coached from 1986-90. Last year, the Colonials went 10-5-4 and lost in the first round of the tournament – despite winning nine of 10 games earlier in the season.